The atomic force microscope is an amazing device. I remember the first time I ever used one, I was completely blown away by what I was able to see. But I also remember that they can seem pretty quirky things until you get a bit more familiar with them. Using one is a lot like learning to drive - the learning doesn't really begin until you get out on the road on your own. It's then that you discover the nuances of driving, when everything your instructor had to remind you to do becomes second nature. In real life, hands on experience of working with an AFM can be as daunting as taking your first car out for a spin. Often students and post-docs can find themselves nudged towards the AFM by their supervisor or peers. Wide encouraging smiles and nods of heads suggest that if they just crack on they'll soon get the hang of the thing. And they do. 1) Sample prep - it's really important that you are highly disciplined when preparing your sample. You need to make sure that you repeat the same steps each time. If you deviate in your prep, there's a good chance that it will interact differently during imaging, which will affect what you're able to see with the AFM. 2) Know what you're expecting/wanting to see - You need to have a good understanding of the probable dimensions and shape of sample features and structures BEFORE you start. What width and height are my features? Are they evenly distributed across the sample or sporadically clustered? Then set your parameters on the AFM accordingly. Having the settings wrong can result in long hours of futile effort with little reward. 3) Pick the right probe for the job - the right probe will depend a lot on your sample, and the choice of probes available can be daunting. The first thing to consider is the sample material, then choose a probe that will maximise imaging resolution and stability whilst not damaging the sample. Standard AC mode silicon probes (for tapping/non-contact) will be perfectly fine for imaging a wide range of materials in air, but things get tricky when the sample is softer or when imaging is performed in liquid. Then what about surface topography - are we talking salt flats or alpine peaks? A probe with a high aspect ratio tip might be needed to image the bottom of a trench. The list goes on. If you're not sure what you need then give us a call. We're always willing to offer advice. Final word regarding probes - always consider whether the probe is brand new or if it's been used before, and don't underestimate the amount of contamination there can be in a laboratory environment. I would always advocate using a new probe if you want those perfect images for a publication. 4) Are you aligned correctly? 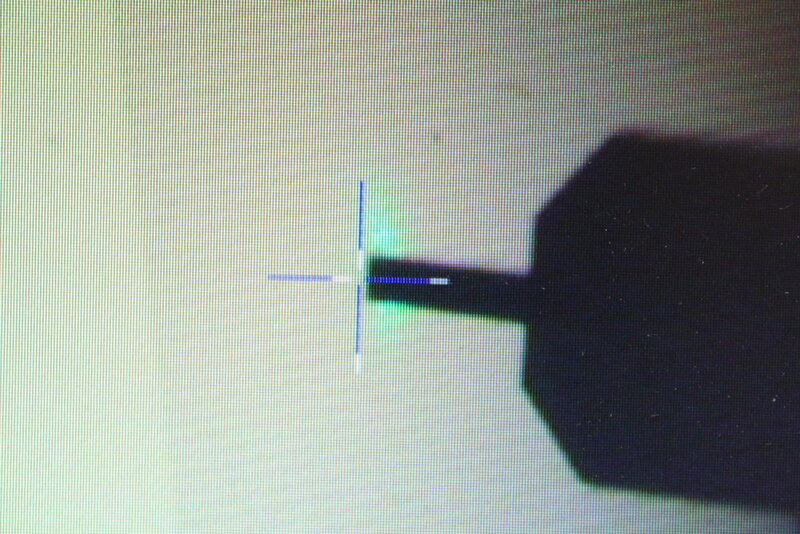 - You need to make sure that you've aligned the laser spot on the end of the cantilever (as close to the tip as possible). Sounds simple, but for new users, not familiar with the construction of an AFM probe, it's all to easy to get a good laser reflection on the detector but not actually be reflecting off the cantilever. Knowing the size and shape of the different components of the probe (upside down of course) is crucial. Aligning the laser at the end of the cantilever will give you the best sensitivity. For best imaging, the laser should be aligned at the very end of the cantilever. 5) Practice makes perfect - When you start driving, you can't expect that the first time you get behind the wheel of a car you'll drive perfectly and effortlessly arrive at your destination in good time. Likewise, when you start out working with your AFM don't expect to get perfect images first time. In fact a lot of the scientific insights arises from the problem solving, figuring out why you're not seeing what you think you should see and changing your process accordingly. Keep at it and you will find that you become much more attuned to how the AFM and your sample are interacting. And, when it doesn't work you can quickly identify what the underlying issues might be. Doubtless this will all make using AFM sound a bit fiddly but when you started driving a car it probably felt like there were a million different things that you had to think about all at the same time. Now you check your mirrors regularly as a matter or course and don't have to consciously remember 'mirror, signal, manoeuvre' etc. If you're already an experienced user then this is all pretty obvious, but whatever your level of knowledge and skill please feel free to print this out and stick it on the wall (near the AFM...) to help those less familiar with using the instrument. And as ever we'd like to hear from you - what are your top tips for working with AFM? What was your first experience like? What is the one piece of advice you always make sure to pass onto first time AFM users?